You may have noticed some changes in the Herb Garden this year. Curator Maeve Turner gave us an inside look at her soil solarization experiment and crop rotation project. After having problems with pests and disease in the Herb Garden, Turner wanted to try some different methods of organic pest management. 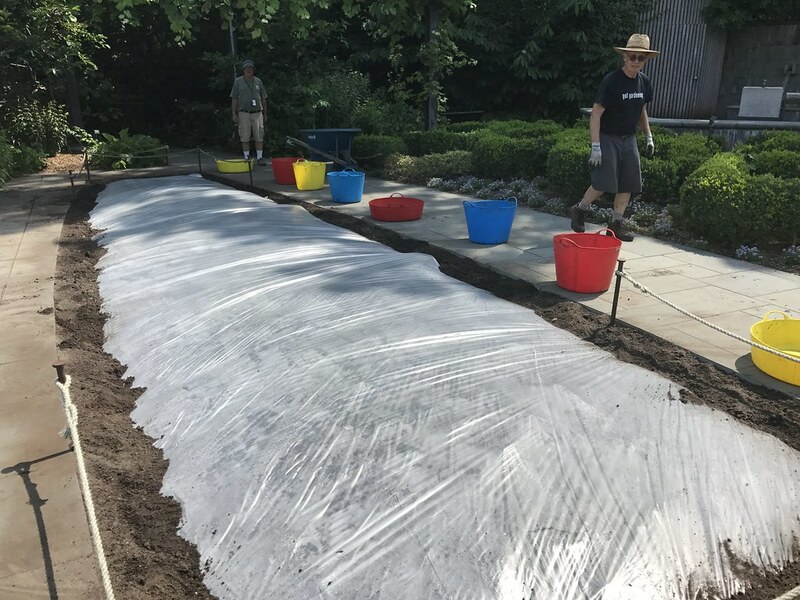 In July, she and her team stretched two layers of thin, clear plastic over a small bed in the Herb Garden to experiment with soil solarization. This setup creates a greenhouse effect by trapping air between the layers, and the trapped energy heats the soil to temperatures that pathogens and pests in the soil cannot survive. With the season’s cooling temperatures, the experiment has come to an end, and soil samples will be tested to determine the success of the project. Turner and her team also experimented with another horticultural practice, crop rotation—moving plants into new beds for the first time since the Herb Garden’s reopening in 2010. Not only are growing conditions improved but the plants’ new homes give the garden a fresh feel. You’ll discover the four geographical regions represented in the garden—the northern Mediterranean; the Fertile Crescent and Sub-Saharan Africa; the Americas; and East, South, and Southeast Asia and the Pacific—have shifted. 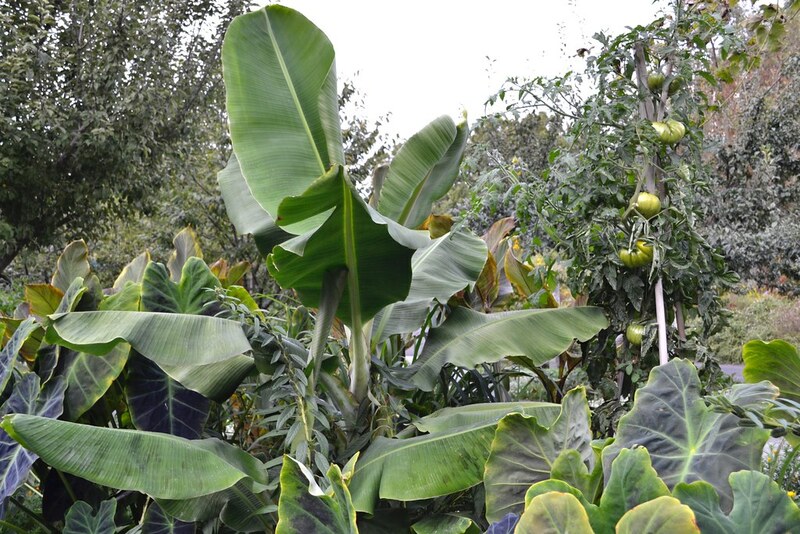 Turner also added some exciting new plants this year, including a banana plant, which you can find in the northwest corner of the Herb Garden. Be sure to take in all the changes and embark on a botanical trip around the world during your next visit. Sarah Gowanlock is a membership associate at Brooklyn Botanic Garden. Maeve Turner, curator of the Herb Garden, responds to Rebecca’s query: The target of the project was an unidentified pest and/or pathogen. We’ve been having tough plants die in the bed (but the same plants in beds right next to the suffering ones look fine). The disease lab didn’t identify any specific disease, but I have had a positive identification of root knot nematodes in other beds in the garden, so that is a strong possibility. We have sent out before and after samples to analyze the microbiology of the soil and will get a report of the microbial diversity (i.e., what percentage of good guys vs. bad guys), and hopefully that will tell us how successful the experiment was. What is your best suggestion to reduce mosquitoes in the lawn with the least harmful pesticides possible? I want to encourage the family to come out, but the mosquitoes are a deterrent. I’ve tried herbs and marigold, but the biters tend to hover over grass. Curious as to what pathogens/pests were being treated with solarization. I’ve used it to rid a garden of Japanese knotweed, but very interested to know what was discovered in the Herb Garden that this method was used to treat. Thanks! Plastic sheeting can be used to heat soil and kill pests and pathogens. Photo by Maeve Turner. Musa acuminata (banana) with Sesamum indicum (sesame) growing among its leaves. Photo by Blanca Begert.